IN earlier times, village communities in Haryana had a lot of expertise in harvesting runoff rainwater. Rainfall was scanty for major part of the year but fell in torrents for a few days when the monsoon became active over the south-western part of Haryana. The terrain in this part of Haryana is sandy and interspersed with low hills of the northern Aravallis. The rainwater either quickly runs off or is absorbed quickly by the sand. Not a drop is left when the rain ceases. In these peculiar circumstances, the early settlers in this area invented and innovated techniques which not only proved remarkable in storing runoff rainwater but also proved efficient in harvesting even a few droplets of rainfall which could be stored in kunds or underground tankaas. Various methods employed to harvest rainwater existed for a long time in other deserts of the world but none was as unique and efficient as developed by people living in the Thar desert. People inhabiting the great Thar desert, including large sandy region of south-western Haryana, used pucca talaabs or masonry tanks for storing water. People in this region of Haryana were aware that runoff rainwater collected in a depression or a natural pond could not last long and evaporated during the long and extremely hot summer months. A large quantity of water thus stored was also absorbed by the earth. People in these areas thought of constructing masonry tanks or pucca talaabs and exploited every possible idea to design structures which were people- friendly, socially acceptable and attractive. Besides contributing in terms of money, the village communities also organised manpower for constructing these tanks. In the last four centuries, hundreds of magnificent masonry tanks were built by the people of Haryana in their villages and towns. For over a decade, my associate Raj Kishan Nain and I have surveyed and photo-documented nearly 50 small to large-sized masonry tanks in Haryana alone. Besides, we have done similar work in the entire Shekhawati region of Rajasthan too. In Shekhawati, the spectacular Panna Sagar at Khetri town stands above all others in its size, magnificence and grandeur. This masonry tank was built by Seth Panna Lal, a wealthy Mahajan of the town. In Haryana, the twin tanks (Brahm Sarovar) at Thanesar (Kurukshetra) are indeed large but they cannot surpass the magnificence of the Ramsar or Barra Talaab at Rewari town. The Ramsar, completed in 1806 AD, is known for its magnificent architecture and design. Another grand masonry tank is at Seeha village in Rewari. Small and medium masonry tanks found in Beri, Nuh, Hodal, Rampura, Narnaul, Charkhi Dadri, Madhogarh, Tusham, Rohtak, Jhajjar, Miran, Jind, Safidon, Baund, Chhuchhakwaas, Bahu Jholri and Panipat are also significant in their own way. A few other masonry tanks, architecturally less significant, are at Subana, Loharu and Kanwali. All masonry tanks were constructed with a singular purpose: of storing rainwater and using it later in lean times. The monsoon often fails to bring sufficient rainfall in the south-western region of Haryana. There were at least a dozen severe famines in the 18th and 19th centuries in this part of the state. The facts relating to the construction of these tanks are as fascinating as the grandeur and architectural designs of these structures. Most masonry tanks in Haryana were either constructed by philanthropic and wealthy people or by the village and town communities in the 18th, 19th and early 20th centuries when famines struck this land. When monsoon failed and crops could not be raised, people thought of constructing talaabs. Not all talaabs, however, were constructed keeping in mind the above need. A few like Jal Mahal Talaab at Narnaul, Phullu Wallah and Janaki talaabs, both at Beri town, and Aishwan Talaab at Chhuchhakwaas were constructed mainly for private use. These sites were utilised for entertaining members of one’s family and private guests. Most pucca talaabs in Haryana, whether constructed for private use or for community use, are today in a state of neglect and decay. Jal Mahal Talaab at Narnaul was built around 1600 AD by Shah Kuli Khan, a General in the Mughal army. When Dohan, a mighty stream 10 km west of Narnaul, was inundated during the monsoon, Jal Mahal Talaab and half a dozen other talaabs around Narnaul received plenty of water. Later, in the 19th century Barra and Chhota talaabs to the north-west of Narnaul, Har Gopal Talaab to the north of Jal Mahal Talaab, Khaleel Talaab adjoining Jal Mahal and Shobha Sagar to the south-east of the town were built by wealthy merchants and influential residents of Narnaul. Obviously, the residents of Narnaul town had ensured plenty of water for themselves by constructing these talaabs. Wells and baolis were also built near these talaabs. Regrettably, the present generation faces acute shortage of water despite the fact that scores of deep tubewells were installed in the last three decades in the dry beds of the Dohan and Krishnawati streams. The talaabs in Narnaul still get filled with rainwater, but for over a century and a half the biggest and most magnificent talaab — Jal Mahal — has remained empty mostly due to human neglect. A number of colonies have come up in its catchment area. Roads nearby obstruct the water inflow from the Dohan. Another more serious factor has been the construction of a dam and a reservoir on the Dohan by the Rajasthan Government. This has left no hope for the restoration of Jal Mahal Talaab. A fine masonry tank was built in Kultazpur village, situated in the plains of Dhosi hills, 150 years ago by a local sadhu. Matsaya i.e images of fish were sculpted on each of the four quays of this tank, symbolising origin of life in water. At Nuh, a small town in the Mewat area, a fine masonry tank was built by Seth Choohi Mal some 150 years ago. Lala Chander Bhan, the eighth descendent of Seth Choohi Mal, told us that this tank continues to receive rainwater flowing down the Kala Pahar, 2 km away. The seth had got this talaab constructed for the benefit of Banjaras who carried salt on hundreds of bullocks from the Sambhar lake in Rajpootana. 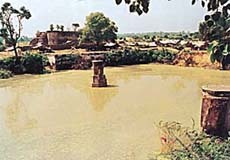 Compare this with Aishwan Talaab, a small masonry tank at Chhuchhakwaas village, 10 km north-west of Jhajjar town. The tank was constructed by Abdur Rehman Khan, the last Nawab of Jhajjar pargana, who was hanged in December 1858 by the Britishers who accused him of providing support to the sepoys in the First War of Independence in 1857. This private tank is in a state of partial ruin now but the adjoining resthouse, also built by the Nawab at the same time, is now being used as a godown by the P.W.D. Such is the state of a fine resort once frequented by the Nawab and his friends. Sometimes the facts related to the construction of a talaab are more interesting than the architectural design of the structure. For instance, the Ramsar at Baund village and Shyamsar at Charkhi Dadri (both in Bhiwani district) have interesting tales associated with their origin. At Baund, Roodh Mal, a pious Brahmin did a fine job of constructing the Ramsar talaab. He also constructed a well and a temple on its banks. One hundred and forty years ago, his father Gumani Ram had acquired great wealth from South India. He had been a pauper when he had left the village one night to try his fortune. Carrying out his dying father’s instructions, Roodh Mal got the talaab constructed. At Hyderabad, his father had served a wealthy merchant for at least five decades before finally returning to Baund at an advanced age of eighty. The merchant, who was issueless, gave away his property to Gumani Ram, who later removed the moveable valuables to Baund. Thus, originated a fine tank at Baund and also a fine haveli constructed by Roodh Mal. 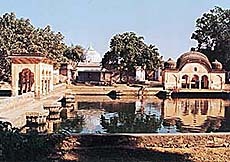 Shyamsar at Dadri, though constructed with a considerable sum of money, had its origin in a clash of egos between a wealthy seth and a self-respecting Brahmin. Seth Sita Ram of Dadri, who earned considerable influence and wealth while serving in the Mughal court, had established the now famous Sita Ram Ram Bazaar in old Delhi (Shahjehanabad), made a heap of gold and silver coins in front of his blind mother on returning to Dadri. His mother was immensely pleased at the success of her son and wished the entire sum to be donated to an outstanding Brahmin. The seth called on his purohit and, while donating the entire amount contained in the heap, boasted that the latter might not have seen in his life such a large sum as being given as donation. The self-respecting Brahmin was deeply hurt and annoyed. He announced that he would prefer to renounce the donation. The seth, who did not expect the Brahmin to reject his offering, realised his mistake and repented. The Brahmin, however, stood firm on his decision. The indignant seth then approached a sanyasi who used to meditate at a nearby pond. After listening to his tale of woe, Shyami Baba, the sanyasi, advised the seth to invest the entire money in converting the kuchcha pond into a fine masonry tank. Thus originated Shyamsar some 350 years ago at Dadri. This tank along with some wells and a couple of old temples — added later by other merchants of Dadri — still exists but regrettably all the structures are in a state of neglect. The tank is filled with stinking water and considerable filth floats on its surface. There have been no efforts to clean it and restore its old glory. Ugly houses have sprung up around this once magnificent and picturesque masonry tank which used to receive rainwater from the huge hill near Kaliana village. In Beri town, once famous for its wealthy Mahajan community and the Debi fair, we found three masonry tanks — Phullu Aala, Janaki Aala and Paras Ram Aala. The last built over a hundred years ago near a fine and tall Shiva temple is now completely in ruins. Phullu Aala, built by Seth Khubi Ram, in 1893 AD is also in a state of utter neglect and lies to the south of the town behind Power House. Though Janaki Aala, built as a private resort by Seth Janaki Das, retains some grandeur, it remains deserted. Its caretaker says the family of the seth seldom visit Beri. All the three masonry tanks built with lakhauri bricks and stone slabs by local masons over 100 years ago were commissioned by wealthy merchants of Beri. For their commendable work, they even obtained sanads (certificates of merit) from the then Commissioner of the Punjab. Due to lack of periodic maintenance, these useful tanks gradually decayed. The municipality can do little as they are private estates. A few miles away at Jhajjar town, a pargana bestowed on Nizabat Ali Khan by the Britishers in 1803 AD on account of excellent military services rendered by him and his troops against the Marathas, can account for three masonry tanks. 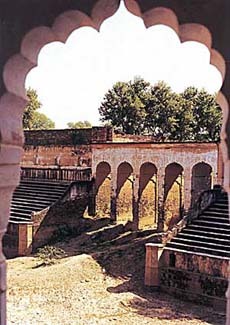 His successor Faiz Ali Khan and his officers had built three fine masonry tanks in the early 19th century. Of them, only two survive. The largest of them, Ghazi Kamal, is in ruins and is filled with filthy water. But Buwa Wallah Talaab, near a couple of mausoleums on the Jhajjar-Delhi road, is worthy of description. Buwa Wallah Talaab is a deep square with covered shelters for women on one of its four quays. A brick-plastered, artistically designed pillar, erected at the centre, indicated the water-level. It is in a state of partial ruin today. Another masonry tank which does not exist any more also contained a round-shaped, two-metre-high pillar, which was used for keeping lighted earthen lamps. We learnt about this usage by seeing an old photograph in the personal archives maintained by Shri Raj Kishan Nain of Ajaib village. Some masonry tanks like those at Jind, Safidon and Seeha had a distinct architectural style. 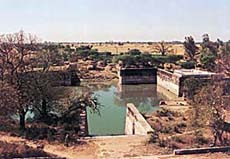 The masonry tank at Jind came to be known as Bhooteshwar Talaab because of a Shiva temple in the middle of the water body. It was built around 1857 at the behest of a lady of a royal household. The lady, a devout Shiva follower, wished that a temple be built in the middle of the talaab. Verandahs were later added on all four sides of Bhooteshwar Temple. Although many adjoining structures were demolished a few decades ago, Bhooteshwar Temple and the talaab got a new lease of life a few years ago when restoration work was carried out by the district administration. The description of fine masonry talaabs of Haryana found no worthy mention in any of the official records seen by me so far. The Settlements Reports of the districts compiled and written by British officers in the last quarter of the 19th century hardly contain a line or two about the major tanks. Many fine pucca talaabs like the one at Seeha village in Rewari district escaped their notice. Shri Ram Swarup, follower of Sant Dadoodayal, prepared a plan for the construction of a pucca talaab in Vikrami Sambat 1914 (1856 AD). He had in mind the piedmont plains of a large hill to serve as catchment area for the talaab. Even in the wake of disturbances caused by the First War of Independence in 1857, the construction activity did not cease. In the course of the next three years and after spending Rs 99,000, a grand and magnificent structure took shape. This talaab is 40 feet deep and is a square of 250 feet. The four-tiered talaab has five quays; three step quays for men and one finely laid, jali-covered step quay with underground enclosures for women and one inclined path quay for the cattle. The material used in the construction of this tank was quarried from a nearby hill. Due to inadequate rainfall for over a decade and a half, Seeha Talaab has remained dry. It is regrettable that the catchment area of the talaab is becoming potholed due to unscrupulous quarrying by villagers. In future runoff rainwater from the hill will not reach the talaab unless the quarrying is stopped. In spite of the prolonged drought, the fine structure of Seeha Talaab retains its architectural magnificence. Two fine masonry tanks, one at the hilltop and another below it in Madhogarh village, attracted my attention. Madhogarh, a village famous for its old havelis, is situated in the foothills of northern Aravallis. The masonry tank atop the hill is said to be built in the early 18th century by the garrison commander of the nearby fort. The fort is in ruins but the hilltop talaab is still in a fine state. The masonry tank below the hill was built 130 years ago by the Mahajan community of the village. Both these fine tanks remain almost dry due to the continuous spell of drought, spanning almost a quarter of a century now.